The Amazon SimpleDB is a non-relational database that can provide you with a high availability as well as durability across several automatically created data replicas. It is more suitable than a relational database due to its simplicity and usability. Although the Amazon AWS did not create any user interface that can be used for managing SimpleDB database, there are still other applicable solutions. The Elastic Cloud Gate has a developed user interface that enables you to create and manage your Amazon SimpleDB. Through this tool, you get to explore your SimpleDB domain quickly and easily. It allows you to add, edit or delete attributes with just a few clicks. You now have the option to migrate your current resources to a another AWS region. You can now transfer SimpleDB across AWS regions for backup and recovery purpose, improved applications stability as well as a higher fault tolerance. Are you looking for a perfect solution for your SimpleDB backup and restoration? You do not have to look too far. Elastic Cloud Gate can give you an option to import or export SimpleDB data to or from csv files. 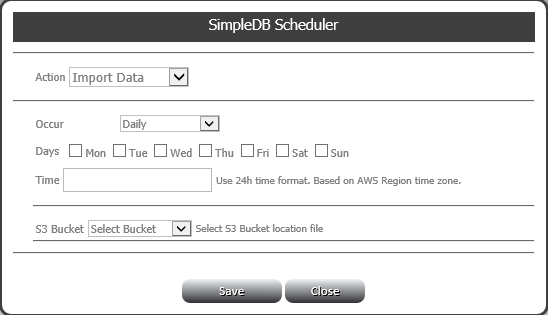 Aside from the immediate import and export of data, you can also schedule your SimpleDB backup on a daily, hourly or monthly basis. This way, you do not have to worry about your entire database, since you already have a SimpleDB backup that you can restore and retrieve any time you need to. With all of these functions, restoring and backing your system up is no longer a hard task.